SPA Weld Bug:Makes your weld go round: The SPAce Bug® is a versatile, automated all positional orbital welding system. Featuring programmable and automatically reversible welding parameters, analog or digital SPAce BUG® incorporates a “Band & Bug” system with internal or external wire feeder. The SPAce Bug® is up to three times faster than cellulose electrode welding. In addition to increased deposition rates operator efficiency increases by 75 % using the SPAce Bug®. Due to its unique lightweight and ergonomic design the Space Bug sets new standards in handling of an orbital welding machine compared to already existing systems on the market . On board (5 kg) wire spool holder with quick lock mechanism for a fast and easy change of spool. Alternatively, the wire feeder from the power source can be utilized. · Digital and analog versions are available. · Programmable welding parameters with memory storage for programs through remote control unit. · CW (clockwise) and CCW (counter clockwise) welding with one single SPAce Bug®. 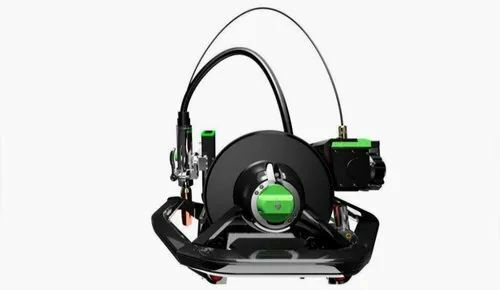 · All modules sealed for welding in outdoor environments · On board (5 kg) wire spool holder with quick lock mechanism for a fast and easy change of spool. Alternatively, the wire feeder from the power source can be utilized.